This is actually the main purchase for this haul, all the other items (except for the tassel earrings) were merely order-fillers. I love the bag the moment I saw it on Dresslily's website. I already saw this from another site, but it was out of stock there. You can't imagine how glad I was when I saw that Dresslily had this too, so it went straight to my shopping cart. It is huge and super roomy! Exactly the same dimensions as mentioned in the website. It has a free purse where you can out your coins and other knickknacks. The material used is some kind of synthetic pebbled leather. It doesn't look thick like the the material of the bag in the photo on the website, but it looks sturdy and good enough. The inside is not at all lined, but it is well-made and the sewing is impeccable. The closure is a magnet type and the zippers are just for decorative purposes. I love how unique the design of this bag is, I haven't seen anything like it in stores. It comes with a strap, and I hope it's sturdy enough to hold all my daily stuff that I bring with me. But you can't use it as a shoulder bag as the handles are short. It's more of a sling/cross-body and hand bag. I love it so much, one of my best purchases when it comes to bags. 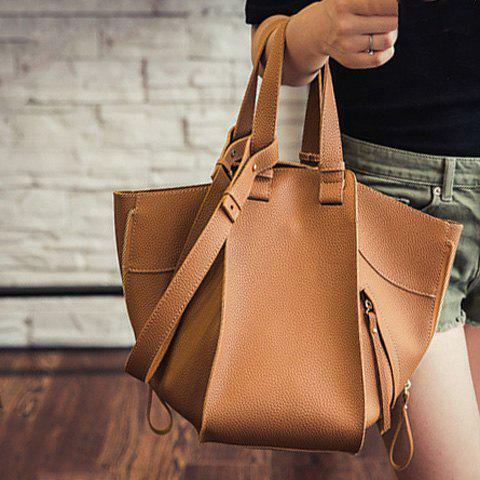 Q:I will like ask its is leather or normal bag...Is it Free shipping to SA. This is a normal bag. The item is free shipping.